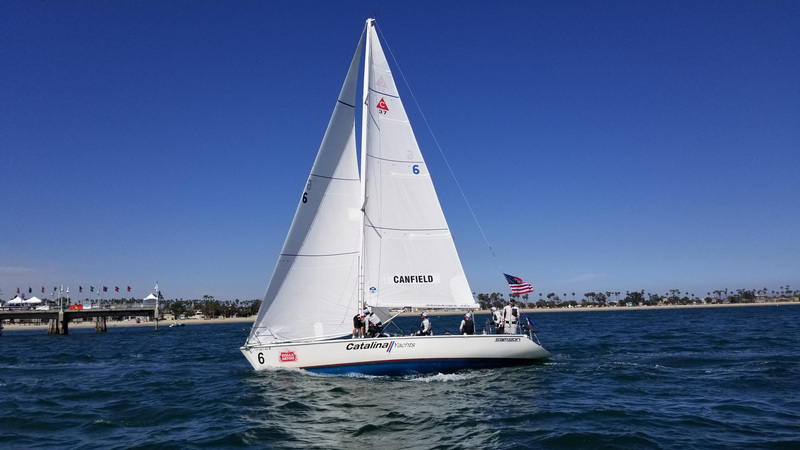 Sailing fans all over the world viewed last month’s 2018 Congressional Cup regatta live in 360-degree VR, courtesy of a partnership between the Long Beach Yacht Club’s (LBYC) media team and several technology firms, including TVU Networks, Samsung Electronics America, Telstra Broadcast Services, BOXX.TV, broadcast integration and project manager Suitelife Systems and wireless innovation house Ocon Solutions Company (OSC). In its 54th consecutive year the Congressional Cup is known in sailing circles as the “gateway to the America’s Cup”, as it features the who’s who of match racing sailors. On two boats off Long Beach Veterans Memorial Pier, two TVU Routers served as sea-bound hot spots, sending 360-degree, live VR footage from two Samsung 360 Round VR cameras – one on a sports fishing boat and one on the anchored MV LOYNES LBYC race committee boat. The TVU Routers provided the high-bandwidth IP connectivity necessary to send moving, high-data VR images from the water to the pier for VR post-production stitching and VR IP network distribution. Two TVU Routers served as sea-bound hot spots, sending 360-degree, live VR footage from two Samsung 360 Round VR cameras. Two TVU Routers supplied the connection needed for the 360 Round VR cameras to provide live distribution to the Samsung VR Video website, as well as the Congressional Cup web site, and Tribeca Film Festival’s website. “The VR wireless connectivity from the water back to the pier and the network streaming set up performed flawlessly thanks in large part to TVU Router,” says Geoffrey Talbot, Executive Producer of the five day live streaming TV production. “Integrating 360-degree footage requires an enormous amount of bandwidth. We couldn’t have done it without the rock-solid connectivity of our TVU Router, which performed above and beyond expectations from stationary and moving boats. The Long Beach Yacht Club Media team produced five days of live broadcast quality coverage of the regatta.